Please click here for the Alegria® footwear size guide. Enjoy stylish comfort with the Alli clog from Alegria®. Premium stain-resistant leather upper with a chic embossed floral design. Comfortable leather interior wicks away moisture for all-day comfort. Dual buckle closure at vamp with a cushioned collar. The footbed is a mix of cork, memory foam and leather-covered latex, and forms to the natural contours of the foot. Footbed is also removable for your custom orthotics. Slip-resistant PU outsole is engineered to reduce heel and central metatarsal pressure, and the bottom is flat to increase stability. Rocker outsole also propels you through the gait cycle, rocking you from heel to toe in a natural motion, resulting in less tired feet and body at the end of the day. Imported. Click here to learn more about Alegria outsole technology. Measurements: Heel Height: 1 1⁄4 in Weight: 13 oz Platform Height: 1 in Product measurements were taken using size 39 (US Women's 9-9.5), width Regular. Please note that measurements may vary by size. 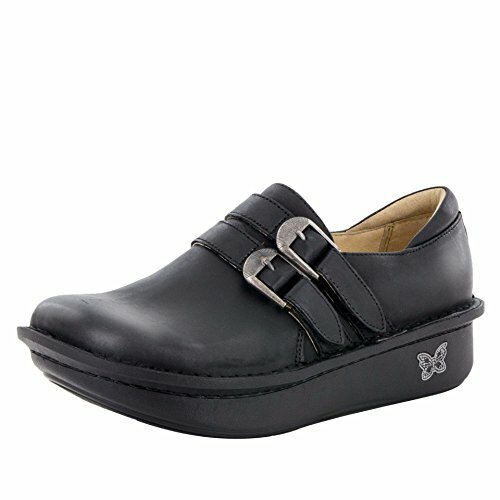 Enjoy stylish comfort with the Alli clog from Alegria®. Premium stain-resistant leather upper with a chic embossed floral design.